By signing Jason Kubel last week the Twins added to what was already a logjam at designated hitter and the outfield corners. Ryan Doumit's role seemed particularly tenuous with his ability to remain an option at catcher in question, possibly leaving him as merely a bad defensive outfielder with a mediocre bat. Apparently the Twins assessed the situation exactly that way, because less than 48 hours after adding Kubel they subtracted Doumit (and then added Kurt Suzuki). Doumit is under contract for $3.5 million in 2014 as part of a two-year extension handed out by the Twins midway through his first season in Minnesota, but he wasn't worth that money in 2013 and ceased being a good fit for the current roster. Simply clearing his entire salary off the books and removing him from the bad-fielder logjam is an accomplishment for the Twins and getting a recent first-round draft pick from the Braves in exchange for Doumit is an added bonus. Heading into the 2011 draft there was some talk of the Twins targeting Sean Gilmartin and as a soft-tossing college left-hander he certainly fit their longstanding drafting approach, but they picked 30th that year and the Braves took him two spots earlier. Three years later the Twins essentially acquired Gilmartin for nothing, but that mostly speaks to how far his prospect stock has dropped and how modest his upside was to begin with. As you'd expect from an experienced college pitcher Gilmartin dominated in the low minors, but he managed just 6.5 strikeouts per nine innings in 20 starts at Double-A and then fell apart at Triple-A this year with a 5.74 ERA, .304 opponents' batting average, and 6.4 strikeouts per nine innings. Plenty of former first-round picks bounce back from struggles in the minors to thrive in the majors, but with a high-80s fastball Gilmartin doesn't seem like a good bet to be one of them. On the other hand he's still just 23 years old and with only three pro seasons Gilmartin doesn't even require a 40-man roster spot yet, which no doubt played a part in the Twins asking for him in the deal. Gilmartin has had extreme splits in the minors--including an .859 OPS versus righties and a .635 OPS versus lefties this year--and could find a bullpen niche as a southpaw specialist. He's more "minor leaguer" than "prospect" at this point, but the deal is about shedding Doumit. It's been clear all offseason that the Twins prioritized adding a veteran catcher and after missing out on both Jarrod Saltalamacchia and A.J. Pierzynski they were linked to second-tier options like Suzuki and John Buck. They ended up settling on Suzuki, who'll get $2.75 million to compete for playing time with and hopefully mentor Josmil Pinto. Suzuki was once a young building block for the A's, but huge workloads early in his career seem to have caught up to him. Suzuki was a college superstar at Cal-State Fullerton, hitting .413/.511/.702 in 2004 before being drafted 67th overall. He debuted with the A's as a 23-year-old rookie in 2007, led the league in games caught in both 2008 and 2009, and then ranked third in games caught in 2010 and 2011. Through his first four full seasons in the majors Suzuki averaged 132 games and 1,145 innings behind the plate, which is a great path to being washed up before age 30. Suzuki hasn't topped a .250 batting average or .700 OPS since 2009 and combined over the past two seasons he hit .234/.282/.332 in 212 games. That's backup-caliber offense at best and while Suzuki has a strong reputation behind the plate his actual defensive numbers have also been ugly recently. His caught-stealing numbers were consistently mediocre until this year, when 57 of 65 stolen base attempts were successful against Suzuki for an abysmal 12 percent throw-out rate. Perhaps more importantly, Parker Hageman of Twins Daily notes that Suzuki fares very poorly in his ability to coax strikes out of borderline pitches. Dating back to 2008 he ranked 52nd out of 66 regular catchers in getting called strikes on pitches deemed to be within the strike zone, a metric which rated Doumit dead last during that same span. Breaking that down further into actual runs, Suzuki's pitch-framing graded out to 24.2 runs below average from 2010-2013. So why do the Twins want Suzuki if he can't hit, his work framing pitches grades out poorly, and this year at least he couldn't throw? First and foremost because the veteran catcher market isn't exactly overflowing with capable options, so it's basically about holding your nose and deciding which huge flaws are palatable. Beyond that the Twins clearly believe more in their scouting and Suzuki's reputation than any defensive numbers. 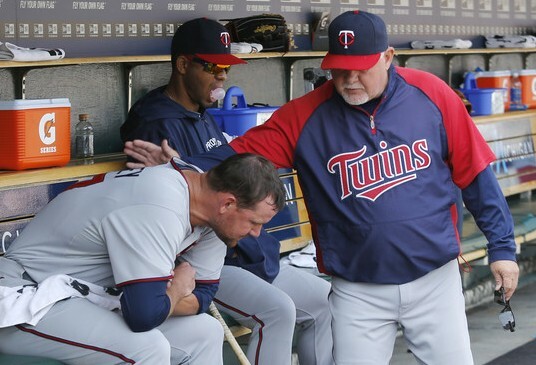 He's a better option than Eric Fryer or Chris Herrmann, although the risk with Suzuki is that it's easy to envision Ron Gardenhire falling in love with his veteran-ness. As spring competition and eventually a backup and mentor for Pinto he's a perfectly reasonable, inexpensive fit, but if Suzuki finds his way into the lineup 4-5 times per week or perhaps even convinces the Twins to send Pinto back to the minors the signing will look a whole lot different. For a lot more on the Doumit trade and Suzuki signing--plus the Mike Pelfrey re-signing--check out this week's "Gleeman and The Geek" episode. • My assumption was that the Twins wouldn't want anything to do with Mike Pelfrey again after he posted a 5.19 ERA in 29 starts, but both Ron Gardenhire and Terry Ryan repeatedly made it clear that they wanted to re-sign him even with Ricky Nolasco and Phil Hughes already added to the rotation. Bringing back Pelfrey at all is odd enough, but bringing back Pelfrey on a two-year contract worth $11 million plus incentives is something I'm really struggling to comprehend. In addition to the bloated 5.19 ERA and .300 opponents' batting average he managed just 6.0 strikeouts per nine innings to rank 81st out of 91 pitchers with at least 150 innings as starters. His walk rate of 3.1 per nine innings ranked 70th out of 91 and for all the talk about Pelfrey's ability to induce ground balls his actual ground-ball rate of 43 percent ranked 55th. He was a fly-ball pitcher with bad control and very few missed bats and he ranked next-to-last among all starters in xFIP. There were certainly some changes within Pelfrey's post-surgery performance, but for the most part he remained the same pitcher relying very heavily on the same fastball thrown at the same speed and his overall results were nearly identical. Which is to say: Not good. Also of note is that Pelfrey has always worked slow, but his pace was excruciatingly lethargic this year. His average of 24.9 seconds between pitches was the ninth-slowest in baseball. He was brutal to watch too. Clearly the Twins, like their fans, were sick of watching inexperienced starters get their brains beat in, because re-signing Pelfrey and signing Nolasco and Hughes to go with holdover Kevin Correia leaves just one spot in the rotation to be fought for by a group that includes Samuel Deduno, Kyle Gibson, Scott Diamond, Vance Worley, Kris Johnson, and Andrew Albers. And soon they'll hopefully need to make room for stud prospect Alex Meyer's arrival. Gibson and Meyer are the only starters in that group around whom long-term plans should be made and the Twins had plenty of money to spend, so shoving aside various back-of-the-rotation options isn't a big deal. But why Pelfrey? And why lock yourself into a two-year commitment to a mediocre-at-best pitcher coming off a season in which he was one of the very worst starters in all of baseball? • Jason Kubel left the Twins as a free agent following the 2011 season to sign a two-year, $15 million deal with the Diamondbacks and now, after one good year and one bad year, he returns to Minnesota on a minor-league deal. This year he struggled with injuries and hit just .216/.293/.317 with a 92/29 K/BB ratio in 97 games, so it's possible that he's simply done at age 32, but Kubel was an above-average hitter in each of the previous six seasons and smacked 30 homers in 2012. He's never been able to hit left-handers and has no business playing defense at this point, but if used correctly in a part-time role Kubel could be a nice addition. And the price is certainly right. Of course, Gardenhire has yet to consistently platoon anyone in a dozen years and there was already a logjam at designated hitter and the outfield corners with Josh Willingham, Oswaldo Arcia, Ryan Doumit, Chris Parmelee, Chris Colabello, and possibly Josmil Pinto in the mix. Doumit possibly no longer being an option at catcher means finding a taker for him and his $3.5 million salary would lessen the logjam considerably, but he was almost as bad as Kubel offensively and is every bit as bad defensively in the outfield. Mike Berardino of the St. Paul Pioneer Press reports that Kubel will get $2 million in upfront money if he makes the Opening Day roster and could earn another $1 million in potential incentives. Right now I'd bet on him making the team. UPDATE: Apparently the Twins agreed. Jeff Passan of Yahoo! Sports reports that they're trading Doumit to the Braves for Sean Gilmartin, a soft-tossing lefty who was a first-round pick in 2011. • Designated for assignment last week to make room on the 40-man roster for the Nolasco and Hughes signings, Liam Hendriks was claimed off waivers by the Cubs. I've already said my piece on the Hendriks decision, but the short version is that despite never being a particularly promising prospect he's still young enough to be useful and the Twins had a handful of better choices to cut loose. There's a decent chance he'll find himself on waivers again before Opening Day, though. • Fan Graphs published the annual ZiPS projections for the Twins and ... it ain't pretty. • Thanks to everyone who bought tickets to the event I'm co-hosting with Twins Daily next month during TwinsFest. We sold out all 125 tickets in three hours, so we're trying to find a way to add some more spots. Stay tuned for more details. • For a lot more discussion about Pelfrey, Kubel, and Hendriks check out this week's "Gleeman and The Geek" episode. This week's blog content is sponsored by 6300 Steakhouse at the Embassy Suites, an American steakhouse with a Cajun flair that features hand-cut steaks, seafood, sandwiches, burgers, and homemade Jambalaya. Please support them for supporting AG.com. • Rochester's playoff run ended Sunday at Triple-A, so the Twins made seven September call-ups after initially not adding reinforcements. Eduardo Escobar, Chris Parmelee, Scott Diamond, and Michael Tonkin return after playing for the Twins previously this season and Cole De Vries is back in Minnesota for the first time this year after spending much of last season in the Twins' rotation, leaving Shairon Martis and Eric Fryer as the surprising call-ups. Fryer is a 28-year-old journeyman catcher with 2,081 plate appearances in the minors compared to 34 plate appearances in the majors. He hit just .219/.339/.365 in 65 games for Rochester and is a career .208/.312/.313 hitter at Triple-A, but with Joe Mauer on the disabled list recovering from a brain injury and the Twins apparently no longer as willing to use Ryan Doumit behind the plate they wanted another catcher around for the final three weeks. Martis is a 26-year-old right-hander who spent most of last season and all of this season in the Twins' farm system after being signed to a minor-league deal. He was a full-time starter until this year, shifting to the bullpen in Rochester and throwing 80 innings with a 4.26 ERA and 65-to-31 strikeout-to-walk ratio. There is absolutely nothing about his performance that stands out, this season or in past seasons, so aside from "they just wanted an extra arm" his call-up is odd. My assumption is that Fryer and Martis will be dropped from the 40-man roster immediately after the season, in which case adding them now has no real impact aside from not giving those same temporary spots to more deserving options this month. De Vries also seems likely to be dropped, along with a handful of other names as part of the annual season-ending purge. Tonkin is the only call-up in the group with big upside, although certainly some people still believe in Diamond. • As for who the Twins didn't add, the healthy players on the 40-man roster who haven't joined the team are Aaron Hicks, Trevor May, Danny Santana, and B.J. Hermsen. Of that group only Hicks' lack of a call-up is at all surprising, because May, Santana, and Hermsen all spent the season at Double-A and Hermsen was bad enough to potentially be dropped from the roster soon. Hicks, meanwhile, was the Opening Day center fielder and spent four months in the majors. 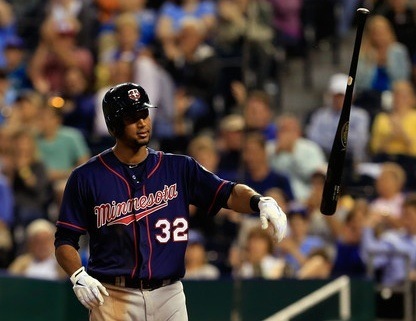 Hicks was terrible following an August 1 demotion to Triple-A, hitting .221/.317/.333 with zero homers and a 21-to-10 strikeout-to-walk ratio in 22 games to continue a miserable season that began with the Twins shoving aside development and service time considerations by rushing him from Double-A to the majors at age 23. Of course, Parmelee hit just .231/.318/.370 in 45 games at Triple-A following his midseason demotion and still got a September call-up. So during the first half of the season Buxton did something only five other players have done in the past 30 years and then during the second half of the season Buxton did a different thing only five other players have done in the past 30 years. Overall he hit .334/.424/.520 with 55 steals, 49 extra-base hits, and 76 walks in 125 games between two levels where the average pitchers were 23 years old. He doesn't turn 20 until mid-December. Buxton is a bad, bad man (or kid, I guess). UPDATE: Right on cue, Baseball America just announced that Buxton is their minor league player of the year, joining Mauer in 2003 as the only Twins to win the award. Butch Wynegar, one of the biggest phenoms in team history, was the youngest Twins cleanup hitter at 20 years and 63 days old in May of 1976. In fact, the 90 youngest instances of a Twins hitter batting cleanup all belong Wynegar and then the 91st spot is Tom Brunansky at 21 years and 266 days old. Steve Brye is the odd man out on that list, batting cleanup six times for the Twins as a 22-year-old in 1971 despite going on to be a career .258/.309/.365 hitter. • After missing all of last season and the first five months of this season following Tommy John elbow surgery Scott Baker finally made his 2013 debut Sunday for the Cubs. He'd been very ineffective while rehabbing in the minors, but Baker tossed five shutout innings against the Brewers in his first start since August 8, 2011. He'll be a free agent again this offseason. • There was some talk of the Twins being in the mix for Cuban infielder Alexander Guerrero, but he ended up signing with the Dodgers for $32 million. • While looking up some stats I stumbled across this tidbit: In their respective Double-A careers Michael Jordan (.289) had a higher on-base percentage than Drew Butera (.287). • Ron Cook of the Pittsburgh Post Gazette wrote an interesting column about Morneau's first two weeks with the Pirates and how he relates to Penguins star Sidney Crosby. • For a lot more on Buxton's great season, plus talk about Mauer's concussion, Josmil Pinto's hot start, and Trevor Plouffe's future, check out this week's "Gleeman and The Geek" episode. 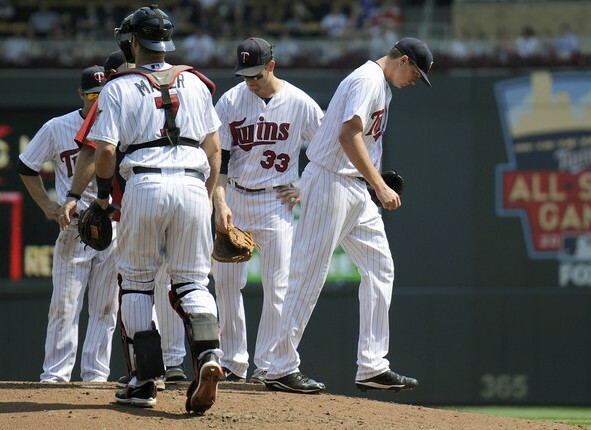 Does a concussion mean it’s time to move Joe Mauer away from catcher? Talk of moving Joe Mauer from catcher to another position has been common since 2004 when his rookie season was ruined by knee surgery and got loudest when he spent half of 2011 on the disabled list, but recently he's been so healthy and productive that it's become little more than a whisper. Unfortunately the volume is rising again because Mauer is on the DL and out indefinitely after suffering a concussion while catching last week. It's a very complicated question. Since coming back from his injury wrecked 2011 season Mauer has hit .321 with a .410 on-base percentage and .460 slugging percentage in 1,149 plate appearances. Among all catchers with at least 600 plate appearances during that two-year span Mauer leads MLB in on-base percentage, ranks second in batting average a few points behind Yadier Molina, and is tied with Molina for second in adjusted OPS+ behind Buster Posey. In terms of career-long production Mauer and Posey are the players with an argument for being the best-hitting catcher in baseball and Molina enters the mix if the most recent two seasons are given more weight. Mauer has also been an asset defensively, throwing out 43 percent of steal attempts this season and 33 percent for his career compared to the MLB average of 25 percent. And for whatever value you choose to place in Gold Glove awards Mauer has three of them. Mauer narrowly misses cracking the top-five first basemen in OPS, adjusted OPS+, and weighted on-base average for 2012/2013, ranking sixth in all three categories. Beyond focusing on where he'd stand relative to the truly elite players at each position, his place relative to the average at each position would also fall. Mauer has an .870 OPS for 2012/2013, which is 22 percent above average for a catcher versus 12 percent above average for a first baseman. As a catcher Mauer is arguably the best at his position and no worse than the top three, producing 20-25 percent more offense than an average player. As a first baseman he'd have zero claim to being the best at his position and realistically slot somewhere in the 5-10 range, producing 10-15 percent more offense than an average player. Or, put another way: By moving from catcher to first base he'd go from elite to merely very good and All-Star spots might be hard to come by. Of course, it's not as simple as looking at where his production would rank at a new position. By moving away from catcher and avoiding the daily physical toll Mauer should in theory be able to stay healthier, play more games, and increase his offensive output. So perhaps instead of being a top-three catcher for 135 games he'd be a top-eight first baseman for 155 games. And maybe he'd go from a top-eight first baseman to a top-five first baseman by not wearing down as much. None of that is set in stone, however. For one thing simply playing first base or even designated hitter doesn't make someone immune to injuries and wearing down, as Justin Morneau has sadly demonstrated. There's also no guarantee that moving out from behind the plate will automatically increase Mauer's output at the plate. Mauer's odds of staying healthy and upping his production should be better at a position other than catcher, but it's impossible to know for certain. Having a great-hitting catcher impacts a lineup a few ways, because in addition to being a strong bat his presence also keeps the team from having to use a weak-hitting catcher and leaves a spot open for another strong bat who doesn't have to be much of a defender at first base, an outfield corner, or designated hitter. If the Twins move Mauer they'd have to find a new catcher who'd be a sizable downgrade offensively and they'd have one less spot for a defensively challenged bat. In terms of in-house options to replace Mauer at catcher Ryan Doumit is under contract for 2014, Chris Herrmann is holding his own as a rookie, and Josmil Pinto is a step away from the majors at Triple-A. Of course, Doumit catches like a designated hitter, Pinto might end up at designated hitter, and Herrmann is a 25-year-old with a .372 career slugging percentage in the minors. It's not a terrible set of options, but that mostly just speaks to the overall weakness of the position. Another potential issue with a position switch is that assuming Mauer's production declines as he gets deeper into his thirties like the standard aging curve he'd remain an above-average catcher for much longer because the bar is so low at the position. First base is a much different story, as a decline-phase Mauer hitting, say, .285 with 10 homers and a .750 OPS, would drop to the bottom of the positional pile pretty quickly. He's signed through age 35, in 2018. Ultimately, though, here's why the speculation about Mauer changing positions has started up again after being dormant for a while: Catching puts players at much higher risk for concussions and none of the above numbers will mean anything if Mauer's career is derailed by brain injuries like Morneau and Corey Koskie before him. Mauer is a great catcher and might "only" be a good first baseman, but a good first baseman is more valuable than a catcher disabled by brain trauma. This is an impossible question to answer definitively, because brain injuries are so unpredictable that even MLB organizations with $100 million payrolls and doctors with high levels of expertise and decades of experience struggle to effectively diagnosis and treat concussions. In general the amount of Mauer's value that comes from being a catcher and in turn his all-around value are often undersold, but the "should Mauer change positions?" question is no longer just about value. For a lengthy discussion about a potential Mauer position switch, check out this week's "Gleeman and The Geek" episode. This week's blog content is sponsored by Ticket King, a local ticket broker that doesn't charge check-out fees, offers in-store pickup, and specializes in Twins tickets. Please support them for supporting AG.com. • Kyle Gibson's first taste of the majors likely came to an end Monday, as the Twins demoted him back to Triple-A immediately following his poor outing against the Mets. Gibson pitched well in his Twins debut on June 29, but was mostly a mess after that and returns to Rochester sporting an ugly 6.53 ERA in 10 starts. His secondary numbers are only slightly more encouraging, including just 29 strikeouts in 51 innings and a .327 opponents' batting average with seven homers allowed. Gibson got knocked around by big-league hitters and looked worn out at times, so considering the expected workload limit in his first full season since elbow surgery shutting him down soon made sense. He's thrown 144 total innings between the majors and minors and by shutting Gibson down after optioning him to Triple-A the Twins keep him from accumulating MLB service time while not pitching, although certainly the demotion could be purely based on performance. There are some positives to be taken from Gibson's first 10 starts, including an average fastball of 92.2 miles per hour and a ground-ball rate around 50 percent, but the questions about his ability to generate strikeouts remain and overall he looked like anything but a top prospect. Hopefully he can come back strong next season, because Gibson will be 26 years old in a couple months and the Twins desperately need someone to emerge as more than a back-of-the-rotation starter. • When the Twins traded Drew Butera to the Dodgers on July 31 for a player to be named later or cash considerations my assumption was that their return would be cash and the considerations would be approximately the cost of a bucket of baseballs. Instead they ended up getting Miguel Sulbaran, a diminutive 19-year-old left-hander with a solid track record in the low minors since signing out of Venezuela as a 16-year-old. As one of the youngest pitchers in the Midwest League this season Sulbaran has a 3.26 ERA and 86-to-26 strikeout-to-walk ratio in 97 innings. For comparison, J.O. Berrios has a 3.45 ERA and 92-to-34 strikeout-to-walk ratio in 94 innings facing the same low Single-A hitters at the same age. Last year the Twins drafted Berrios with the 32nd pick and he has much better raw stuff, so they're hardly prospect equals, but to get any sort of useful player for Butera is shocking. Sulbaran hasn't cracked any Baseball America or ESPN rankings, but Jonathan Mayo of MLB.com recently rated him as the No. 14 prospect in the Dodgers' farm system. Mayo wrote that Sulbaran "has a good feel for his low-90s fastball" and "his curveball is his best offspeed pitch and both his slider and changeup show promise." Butera is arguably the worst hitter of the past three decades, so any deal would get the "great trade ... who'd we get?" treatment, but this is a nice haul. • Parting with Butera is the only move the Twins made before the July 31 deadline, but trades can also happen in August via the waiver wire system and they swung another deal by sending Jamey Carroll to the Royals for the familiar player to be named later or cash considerations. If the Twins get anything decent in return for Carroll that would be even more shocking than the Butera deal, because as a 39-year-old impending free agent he had zero value to them beyond this season. Carroll didn't work out quite as well as the Twins hoped when they signed him as a free agent in November of 2011, but the reasoning behind the two-year, $6.5 million contract made sense. As usual the Twins' infield options were severely lacking and Carroll was a good, versatile defender with strong on-base skills. He did what he was supposed to do in 2012, drawing the third-most walks on the team to get on base at a .343 clip and starting 30-plus games at three positions. When signing a 37-year-old to a multi-year deal rapid decline is always a risk and unfortunately this season Carroll's usually outstanding strike-zone control vanished and the Twins no longer trusted him to play shortstop at age 39. He was a worthwhile pickup who couldn't hold off father time long enough to provide a great return on a fairly modest investment. And yet among all the middle infielders in Twins history to appear in 150 games only 10 had a better OBP than Carroll. • As expected, Justin Morneau passed through waivers unclaimed because he's a 32-year-old impending free agent first baseman with a $14 million salary and a .430 slugging percentage. At this point it's unclear if any contending teams are interested in Morneau, but at the very least no teams were interested in Morneau and the possibility of being stuck with the remaining $4 million on his contract. Clearing waivers means Morneau can be traded to any team, with August 31 as the deadline for postseason eligibility. However, don't expect much if he's moved. Despite a confusing number of fans and media members continuing to act as if Morneau is an impact player he's been a below-average first baseman since the 2010 concussion, batting .257/.317/.409 in 320 games. This year there are 216 major leaguers with at least 300 plate appearances and he ranks 115th in OPS. • Josh Willingham returning from knee surgery followed by Ryan Doumit coming back from a concussion left the Twins with a roster crunch and they decided to make room by demoting Chris Colabello back to the minors. It's a shame, because Colabello's monstrous Triple-A production warranted an extended opportunity at age 29 and he was just starting to show some promise by hitting .286/.397/.551 with four homers and nine walks in his last 16 games. Most of the talk surrounding a possible Morneau trade centers on what the Twins might get in return and whether they should try to keep him past this season, but one side effect is that not trading him takes at-bats away from guys like Colabello who could prove useful on a minimum salary for 2014 and beyond if given a chance. Instead, after hitting .354/.432/.652 at Triple-A he got a grand total of 96 plate appearances in the majors. UPDATE: Well, the good news is that Colabello has already been called back up. Unfortunately it's because Joe Mauer was placed on the concussion disabled list after taking multiple foul tips to the mask Monday. Mauer was dizzy during batting practice Tuesday, which is an awfully scary thing to write following several paragraphs about Morneau being a shell of his former self since a concussion. Brain injuries are impossible to predict, so it's breath-holding time. Because the beginning of the brawl wasn't captured on video it's tough to tell exactly what went on, but by all accounts Mientkiewicz escalated the situation in a huge way by running out of the dugout to tackle the other manager. Twins minor league director Brad Steil issued a statement saying "that's not the example we want him to set for our players" and "he realizes that's not how we want him to represent the Minnesota Twins." However, general manager Terry Ryan explained that the Twins left any discipline to the Florida State League, saying: "Doug was apologetic. I think it's taken care of." And the FSL merely fined him, providing quite a contrast to the Twins allowing Double-A manager Jeff Smith to bench Miguel Sano four games for showboating on a homer and reacting poorly to being scolded. It's obviously apples and oranges, but imagine Sano tackling another player and only being fined. Because that's Frankie. If I try to make Frankie pitch like [someone else], we wouldn't have what we got. That's force-feeding him to do something that he's not comfortable doing. Frankie does pitch the way he pitches. So just let him be him. That's what we did. Maybe he simply needed a fresh start somewhere else, but "just let him be him" certainly isn't something Twins coaches said often about Liriano and his improvement can be linked to a clear change in approach that runs counter to what the Twins preached regarding fastball usage. He's averaged 9.4 strikeouts per nine innings for the Pirates, whereas the Twins have used 10 different starters this year and none have averaged more than 5.4 strikeouts per nine innings. • Whatever slim chance Nick Blackburn had of pitching for the Twins again is over following season-ending knee surgery. Blackburn's contract still includes an $8 million team option for next season, but that will obviously be declined. In signing Blackburn to a misguided long-term deal in March of 2010 the Twins ended up paying $14 million for 408 innings of a 5.56 ERA from a guy who would have been under team control through 2013 even without the guaranteed contract. • Darin Mastroianni wound up spending four months on the disabled list with an ankle injury that was initially deemed so minor that the Twins let him play through the pain for several weeks. He eventually underwent surgery, but now that Mastroianni is healthy again the Twins activated him from the disabled list and optioned him to Triple-A. In other words, Mastroianni lost his job because of the injury. And his 40-man roster spot might be in danger this offseason. • For a lot more about Morneau going unclaimed on waivers and a look at the Twins' options for improving the rotation in 2014, check out this week's "Gleeman and The Geek" episode.